Premstaetten/Austria and Grand Rapids, Michigan/USA (20 February, 2018) -- ams (SIX: AMS), a leading worldwide supplier of high performance sensor solutions, X-Rite Incorporated, a global leader in color science and technology, and X-Rite’s subsidiary Pantone LLC today announced a collaboration to develop an end-to-end mobile solution that embeds color management technology directly into a smartphone for accurate color matching. The joint solution would consist of an ams spectral sensor and optical components packaged into a miniaturised module. The combined offering would enable phone manufacturers and retailers to reshape how consumers search, match and purchase goods such as apparel, home décor or cosmetics using mobile devices. X-Rite research shows that consumers lack confidence in purchasing color-critical items online. This uncertainty is typically due to past experiences which did not meet expectations and a difficulty in communicating color from home to store. Consumers wrongly expect to be able to simply take a photo of the inspiration color with their smartphones and match it to a desired item. However, the wide variety of tones and colors available in home décor, apparel and cosmetics is difficult to accurately reproduce on mobile device displays. Cameras are not precise enough to accurately compare the color between an online product offering and how it will appear in the consumer’s intended physical environment. This makes online color-critical purchase decisions unreliable and limits consumer confidence. 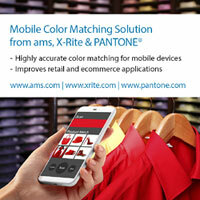 The joint ams and X-Rite solution is the world’s first spectral color measurement solution utilising Pantone Color Standards to be embedded in a mobile device. The miniaturised module is intended for integration in the back side of a smartphone. The module contains an advanced 11-channel spectral sensor and optical components that enable users to measure color of objects in a non-contact manner. The solution will connect to Pantone’s world-leading color reference systems using cloud technology. Consumers, brands and retailers will now be able to identify and share product colors, making it easier to search product catalogs and select color-critical items with confidence. ams and X-Rite will be available for meetings at the Mobile World Congress, February 26 – March 1 in Barcelona. ©2018 X-Rite, Inc. All rights reserved. X-Rite is a registered trademark of X-Rite, Inc. All other trademarks are the property of their respective owners. PANTONE® and other Pantone trademarks are the property of Pantone LLC. © 2018.